Transferring data from one mobile to another has never been an easy task, especially when you are doing this from iOS to Android or Android to iOS. Although most of the part has been covered by the cloud storage backup with which you can easily get all your media including pictures, videos, music just by logging in. However, for the other data like notes, SMS conversations, calendar events, apps, and settings, you always got stuck. Not anymore. Fortunately, Samsung has covered us up with its official Samsung Smart Switch Application that has made transferring easy as a piece of cake. With this app, you can transfer anything, anytime just by connecting your mobile devices without using multiple tools. You can also give a try to Samsung Kies Windows PC Application. Samsung Smart Switch comes with the two versions; The PC or Mac version and the Mobile Version. With the mobile application, you can easily transfer anything just by connecting the old and the new phone using the data USB cable. While the PC or Mac version allows you to backup data, restore anything, synchronize and download updates at once. 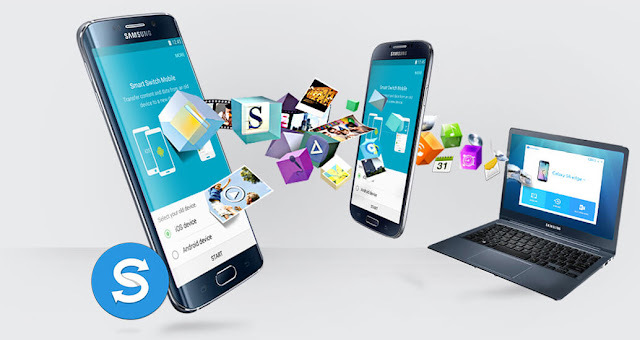 Just like the Samsung Smart Switch Mobile application, the PC or Mac app also offers tons of features to the users. So, if you are looking to switch your mobile phone and your data, Samsung Smart Switch has got you covered. Although you can simply transfer your files using the USB data cable, however, Samsung Smart Switch offers you the peace of mind that you have got all the things transferred without any miss. The Samsung Smart Switch offers the fastest, easiest and the safest way to transfer all your data from your old phone to the new one. After getting the Samsung Smart Switch app on your Windows or Mac, you will be able to quickly connect your mobile devices using the data USB cable. The app, then, will quickly recognize your device on the computer and will allow you to start moving your data from one phone to another. Not only you can switch your data between two phones using Samsung Smart Switch, but also, you can backup and restore your data for the longer run. The app allows you to quickly restore and backup all your data and settings without requiring any additional settings. The Samsung Smart Switch also offers you the smart function of data synchronization between your devices and windows. With this feature, you can synchronize your contacts and all your data, so that you can manage your settings and schedule anytime, anywhere. Not only you can transfer, backup, restore and synchronize your data using the Samsung Smart Switch but also, you can update your phone’s software to the latest update so that you can enjoy all the new features and better performance. So get the Samsung Smart Switch for Windows and Mac and get all your data transferred safely and easily.